To begin your registration, please log in or create a new account using the sign in form. 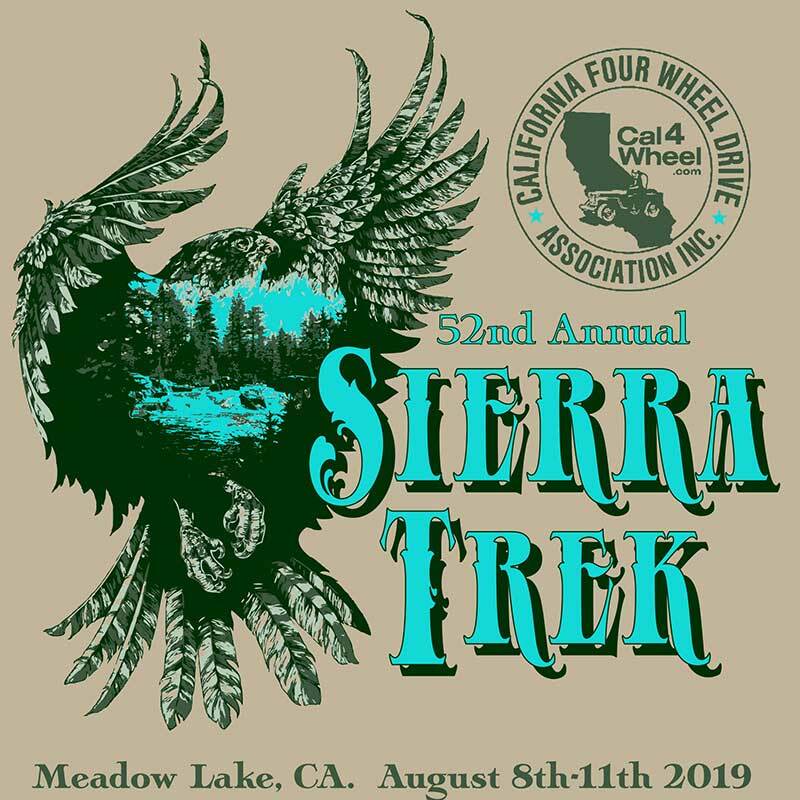 The 52nd annual Sierra Trek is a Cal4Wheel event located in California’s beautiful Tahoe National Forest. This family-oriented event is geared toward everything from stock 4x4s on guided historic and slightly challenging tours to fully built rock crawlers on Fordyce Creek Trail and everything in between. Registration is per person. You must be a member of Cal4Wheel to attend the event. Membership is $50 per year, or you may add a weekend membership for $10 per family. You must be signed in as a valid Cal4Wheel member in order to avoid the $10 temporary membership fee. T-shirt pre-orders end July 12, 2019. Add a second vehicle to your registration. Includes meals for one person. Register a second vehicle for the overnight run. Includes meals for one person. Choose a second run for the weekend. $25 per vehicle. Add additional adults to your registration. NO runs included. Add additional adults to your registration. NO runs or meals included. Add additional adult ATV/UTV riders to your registration. NO camping or meals included. $25 per child. NO meals included. One is included with registration. Available for pick-up at event. Limited quantity on-site. Roll bar or factory installed hard top. Emergency brake, parking brake, line-lock or other redundant braking system. Tow strap or rope (recommend rated at 2 times the vehicle weight). Jack capable of lifting the vehicle & tools to change tire. Spare tire within 3 inches diameter of other tires, or, for tires 37" or larger, run-flats or tools to repair/reinflate tire. Seat belts for all vehicle occupants. Antennas must be rigid or restrained in a manner to prevent injuries. Adequate attachment points front and rear, i.e. tow hooks, receiver, etc. Tow balls are not permitted. Battery hold downs (no bungie cords).